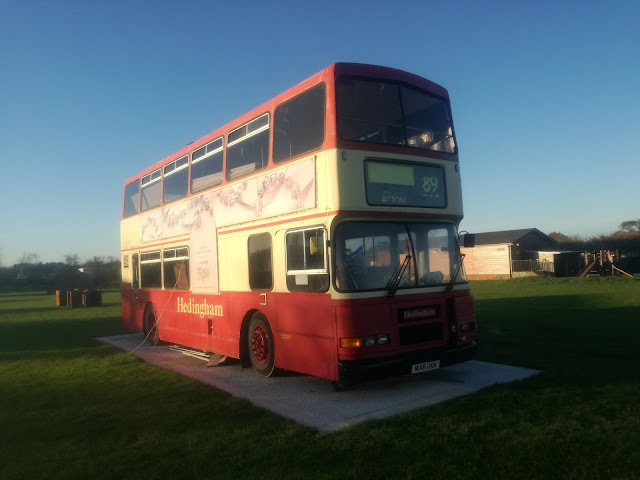 I received tip offs from Malcolm and Robin (Malcolm your parents missed a trick by not naming you Batman) from Borderbus of activity at The Hollies camping and leisure resort in Kessingland. In fact I was basically instructed to go up there for a look. So on Friday I did. The Hollies have purchased 3 ex Hedingham Dublinbus Volvo Olympians, 2 of which are being converted into self catering holiday homes. The third will be having something done to it, but as yet nothing firm has been decided. 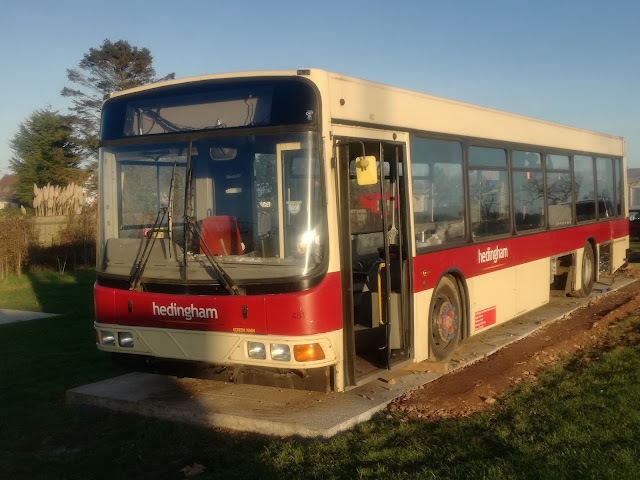 Also purchased is an ex Hedingham Wright bodied Volvo B10BLE which is being converted into a tea room. I went to the site office to find two really nice ladies, including Louise, who told me about the project. I was given a really warm welcome and given permission to go round the site taking photos. The 3 Olympians are on the Glamping field, glamping being a merge of "glamourous camping". One is being used to store the seats of the other 2, and is the one with the undecided future. Ex Hedingham L361 M144 UKN no with more seats than intended! Moving to the main glamping field and next was L360 M282 UKN. 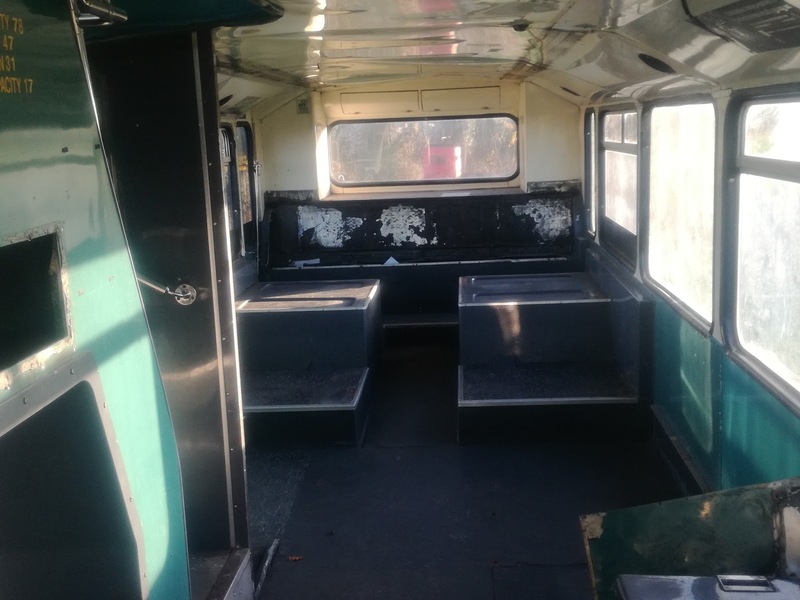 This bus has been stripped out ready for conversion and I was allowed on it to have a look. However it appears some attention is needed to the windows unless a decking balcony is being built and that's where the french windows are going! Nurse for Louise! 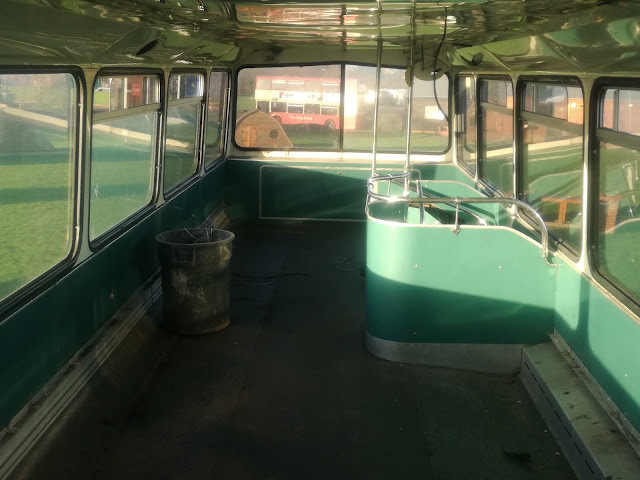 I have a feeling once completed these glamping buses will prove very popular if sensibly priced. It certainly puts a whole new slant on the term "busman's holiday", or should that be "busman's ollieday"! I'm delighted to report the driver's cabs are being retained which should prove very popular with children of all ages - yes very big children too. A railway coach is also being discussed, which again I can see being very popular. I advised that Hedingham were currently selling off the rest of their Olympians and now was the time to buy with DDA looming, so hopefully there will be more additions. The engine and everything else is currently under tarpaulin. No idea if going back but if not there is space for one heck of a kettle! I know most of us would like to see Olympians still on the road in public service come January but it's not going happen. Much better alternative uses that will still bring enjoyment to many are found than facing the scrap man, so I really hope The Hollies are successful in this venture. 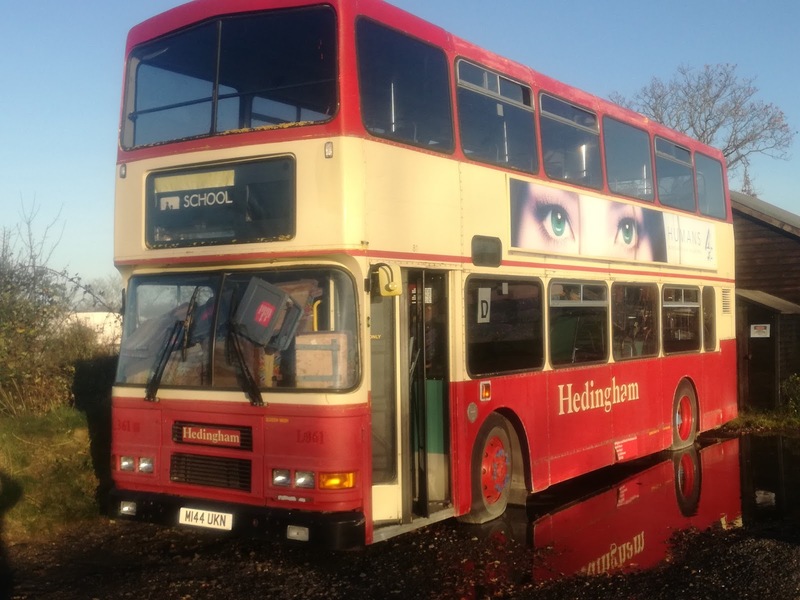 Coming up later this week a bus with a shed on the back. Never thought I'd type those words! Take care all. I was reminded last night of an incident in my Conductor days that became somewhat farcical. It was Friday afternoon peak and some considerate soul had lobbed a bike onto the track at New Cross, which had promptly welded itself to the live rail. Chaos. I was due to work the 1730 Cannon St - Broadstairs service and ended up working the 1708 at 1752. I think. Still not sure which train I actually worked but anyhow it was a little full, and I had to make extra stops at Newington and Teynham to compensate for a cancelled service. "Why haven't there been any announcements telling us what's going on?" "Because at the moment I don't know myself - that's why I'm on the phone trying to find out". "So why haven't you made an announcement telling us you don't know what's happening?" "Because if I was making an announcement saying I had no information I couldn't be on my phone trying to get information with which to make an announcement!" "I see, so you can make extra stops at Newington and Teynham but life stops at Faversham?" Yes I reported myself but I learned my lesson and basically this post is to tell you I have nothing to post about! Nothing is going on. Nothing! It's not made easier by the fact that VOSA have decided to change their website and it's now seemingly impossible to check developments on a daily basis as it was previously. This is leaving everyone in the dark, managers and bloggers alike and is very frustrating. Despite all the "we'll crack it this year" promises the process of leaves detaching themselves from trees has once again flummoxed Network Rail and trains galore are being cancelled, delayed or crocked by slippery rails. Not news as it happens year in year out and is all rather predictable unless you work for Network Rail. So with nothing going on I thought I'd share with you a couple of sites a few of us have added to the badges on our anoraks. The first is an outstanding webcam sited on a restaurant overlooking Miami Airport. If you like planes you won't be disappointed. Every passenger jet you can think of including the gigantic A380 Airbus. Add to that live Air Traffic Control feeds and it's easy to get hooked. It's free unless you decide to go Premium and you can take a look by clicking here. The Maho Beach Cam gives great views of the beach, airport, and thrill seekers literally being blown into the sea by the jets taking off. It's so popular the Sunset Bar, where the cam is sited even has a noticeboard advertising the arrival and departure times of the big jets. You can access this cam by clicking here. Last Tuesday I spent a couple of hours in a field with some Highland cattle - as you do - to try and get some picturesque videos of freight trains currently on diversion down the Medway Valley Line. Here's what I got in very gloomy light. And that's it. If anything actually happens I'll let you know. In the meantime there are plenty of webcams to keep you amused. Take care. Oh Yes We Are, Oh No You're Not! Sorry for lack of posts recently - basically nothing has happened. However this could turn into a huge post which I hope will make up for it. First of all I'm grateful to Phil Kelly for alerting me to a BBC article confirming what we all know, that subsidised bus services have been cut by more than 12% in the past year. The past year? I'm guessing here but I'd say here in East Anglia over the last 6 years they've probably been cut by more like 70%. 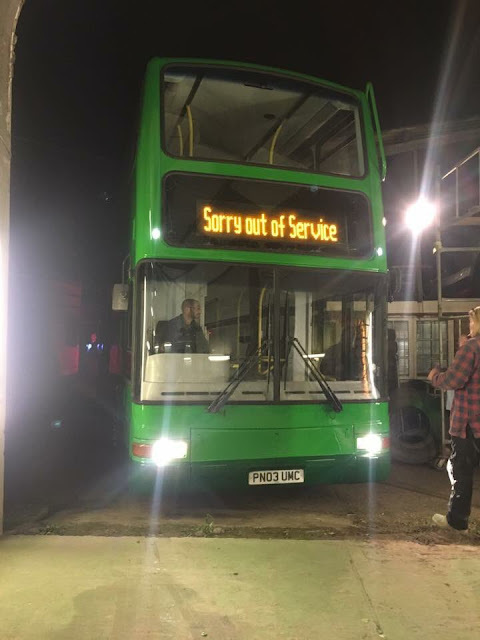 Even the on demand services brought in to replace subsidised buses have been cut, so we all know it's not good. 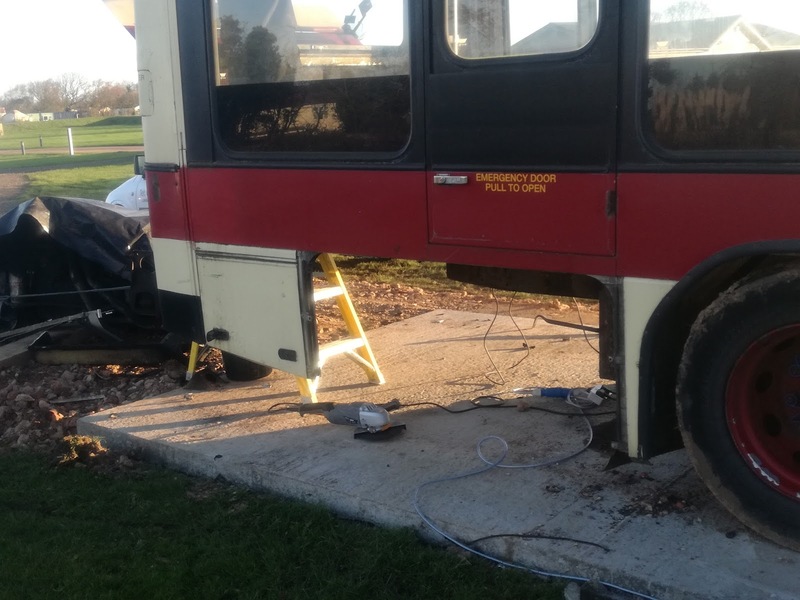 "The Department for Transport said it was working with local transport companies to improve services and boost the use of buses." "If the Conc scheme was fully funded by central government it would relieve the pressure on county budgets. The difficulty would be protecting/ring fencing that money to subsidise loss-making rural services." In other words Councils would use the money to repair schools, keep OAP homes open, filling potholes etc. How very dare they. Of course it's totally justifiable and so any money for bus services would have to be ring-fenced, if it was legal to do so. If it was, however, I can already hear the stampede of other pressure groups heading for Westminster with their own begging bowls which undoubtedly have just as much credence as the bus subsidy bowl does. "The money wouldn't be ring-fenced but the point is well made that the concessionary scheme is woefully underfunded leading to the bizarre situation where people have passes but no service to use them on!" So several mulberry bushes later we reach the same conclusion. Scrap the Concessionary scheme is an option but no Government is going to risk the unpopularity that would ensue. The same would apply if passes were restricted to the County of issue, especially for those on a border. Charging per journey is one option, but I imagine the admin involved - who paid what on what and was it commercial/subsidised etc would be extreme. And so I'm left with what I have been promoting for years now. Charge an annual fee for passes, then holders can use them as and when they wanted - including before 0930 school holidays. That would generate money to subsidise more services, which COULD be ring-fenced, remembering that Councils wouldn't have to pay for journeys made on services they have already paid for, and any fares taken could be ploughed back into the system. More services would encourage more passengers on both subsidised and commercial services. The decline of the last 6 years has GOT to be reversed. One stat that caught my eye in the article was this. There has been a lot of publicity recently about overcrowding on trains, and the need for more capacity. There are still three times more bus journeys made everyday than train journeys. That stat has since disappeared from the article, which can be read in full here. There have been a few repaints. First Norwich ex Leeds Volvo B9tl 36193 is now in Red Line livery, completing the rainbow of colours at Norwich. I can feel a dedicated post coming on that subject. 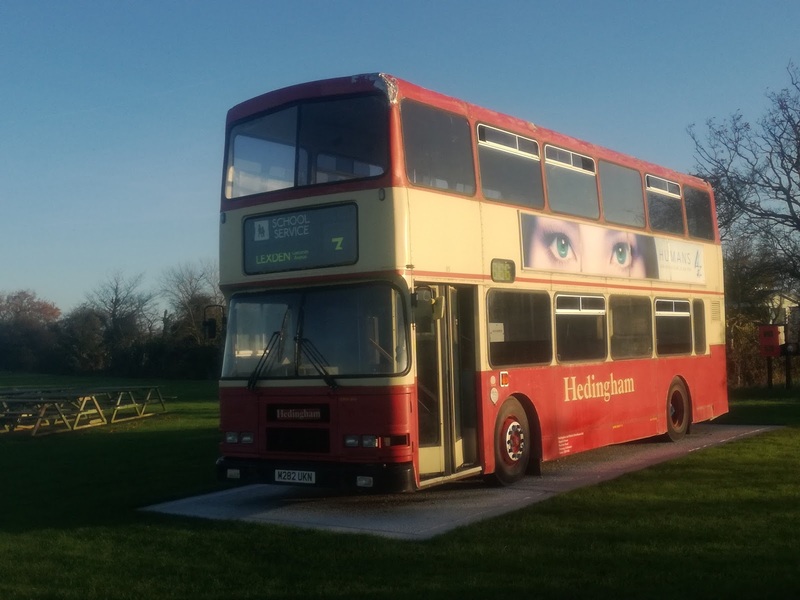 Hedingham Buses tweeted this morning a picture of ex Konect Volvo B7tl Gemini 513, which only a few weeks ago was on loan to Anglian. 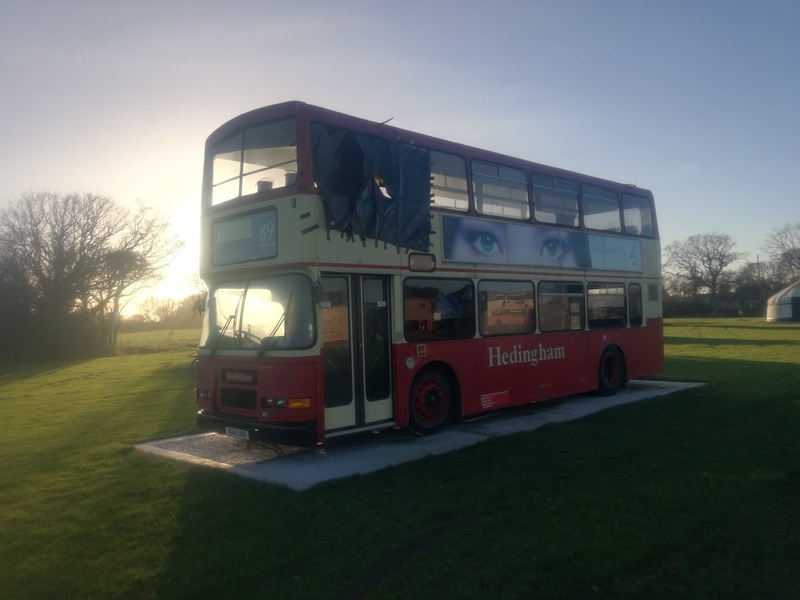 It has been repainted in Hedingham colours and looks quite good. 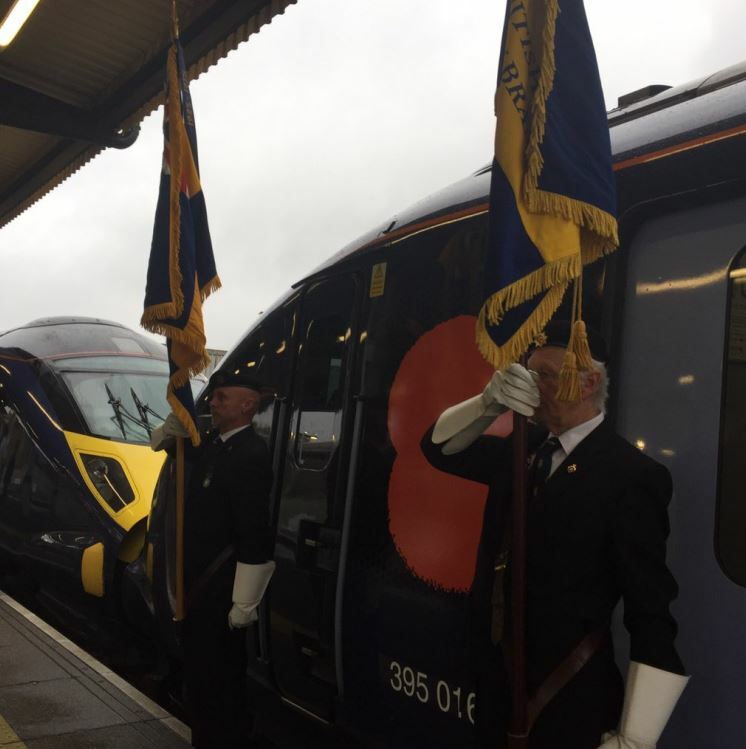 It is expected to be joined by two more of the batch, allocated to Sible depot. 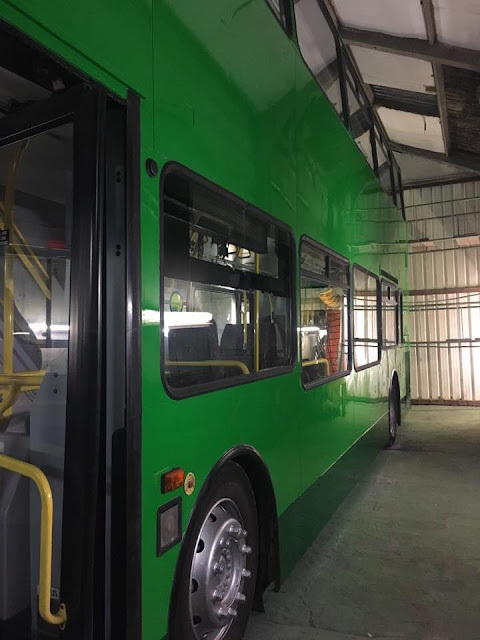 Another repaint to report is that of ex Norwich P&R Trident PN03 UMC. Unfortunately the bus has joined the Company Who Must Not Be Named so can't give more details than that, even if the company sent me a cracking pic of the bus, but on the condition it wasn't published. Thankfully I had already been sent pics by someone else, which shows the repainted President with no identifying company vinyls so here you are. Many thanks to Liv Rayment for permission to use her pics, and I'm hoping to tell you more about Liv in the near future. If you recall I was intending to catch up with the Orange Optare Metrodecker demonstrator which has recently been on loan to Beestons of Hadleigh. Unfortunately it was only used while I was away but Beestons have told me that it was well received and liked by passengers and drivers alike, and they are hoping to get the Blue demonstrator soon. 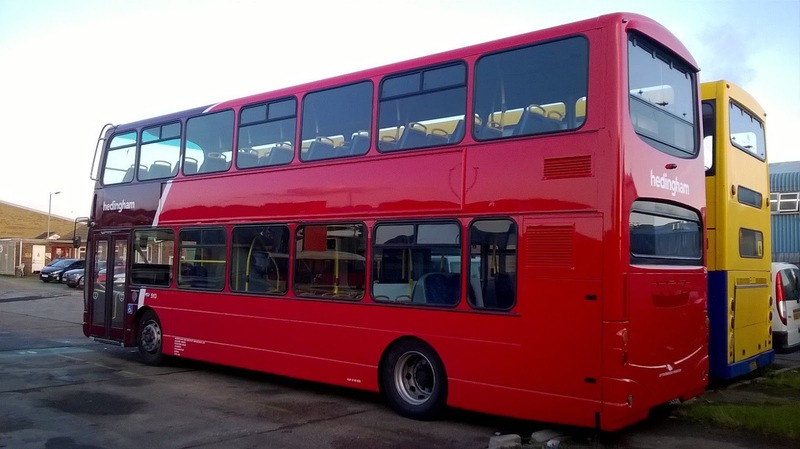 Yesterday, if only for 4 stops while in Lowestoft I travelled on one of First Lowestoft's refurbished Volvo B9 Geminis - 37563 - and have to say the extra legroom upstairs was very noticeable. A great idea to remove one set of seats each side and the two tone leather looks much better. Will have to get a longer ride soon. As you will all know it's Remembrance weekend, and once again Southeastern trains laid on a special train to commemorate the event. 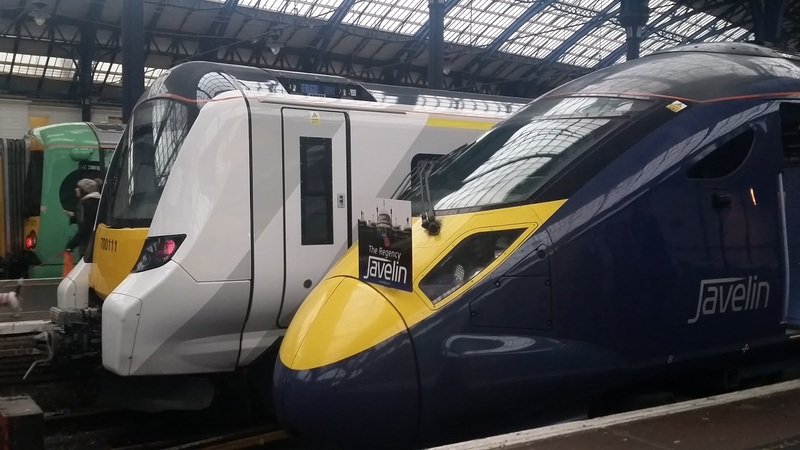 A Class 395 Javelin was vinyled up - 395016 this year, and sent to places not normally served by Javelins. This included Brighton, and I'm grateful to Moleman978 on Twitter for allowing me to use his quite extraordinary picture, which shows the Southeastern Javelin next to a Thameslink Class 700 and Southern Class 377 Electrostar. Not a combination you're likely to see again anytime soon. Southeastern themselves also Tweeted a couple of pics of the day. 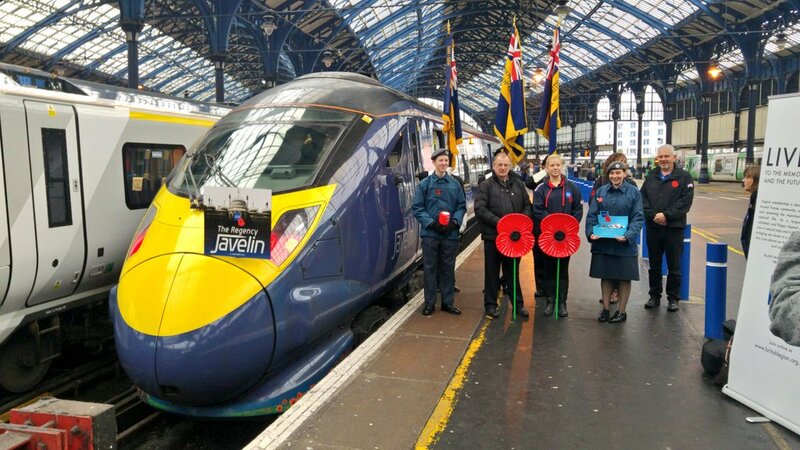 The first again at Brighton. Not sure where this is but could be Ramsgate before departure. Well done to Southeastern. I know a lot of money was raised last year. Since the Javelins are able to operate on both AC and DC lines is there any reason they can't be used on more tours? Apart from being Standard Class only of course! While on the subject or remembering I'm sure our thoughts and prayers go to friends and relatives of the victims of the Croydon Tram tragedy. It was obvious pretty quickly what had caused the tram to tip over, but could take time to ascertain why it was going that fast. The first tram deaths in over half a century. It is impossible to imagine what those involved are going through and I hope they can all find the strength they need to cope. That's it for this post. It's all very quiet out there right now so more posts as and when. The gas bus specials are scheduled for the Christmas period btw, when it will be even quieter!. Take care all.